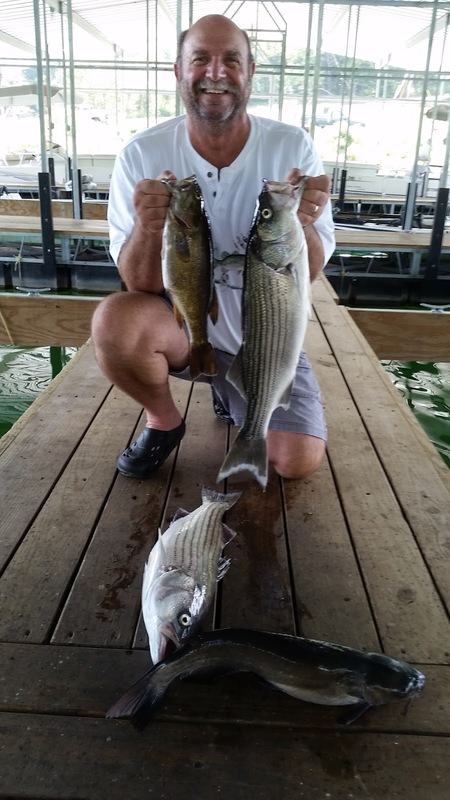 Norfork Lake is in the final stages of the late summer fishing pattern. As the lake water cools and the oxygen returns to all depths the fish will scatter to all parts and depths of the lake. The surface water temperature is slowly falling each day and I would expect to see upper 70's very soon. best in the dam area. The early morning and late afternoon bites are the best and the fish continue to be caught in 25 - 35 feet of water whether on the bottom or suspended in deeper water. 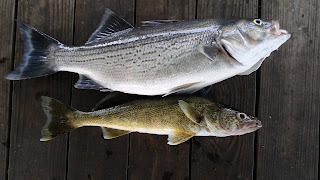 I am starting to find a few stripers heading up river and also back in the mid lake creeks, but no big schools at this time. It will not be long. Live shad, either thread fin or gizzards are working the best, but vertical jigging spoons and casting blade baits worked on the bottom are also picking up some nice fish. The biggest fishing change has been with largemouth, smallmouth and spotted bass. 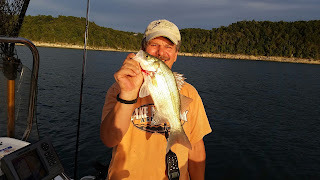 I have located some nice topwater action at sunrise, but it only lasts 30 - 60 minutes. It's plenty of time to have some fun with a spook. The best place for me has been back in a creek that has the old river channel swing in close to shore. 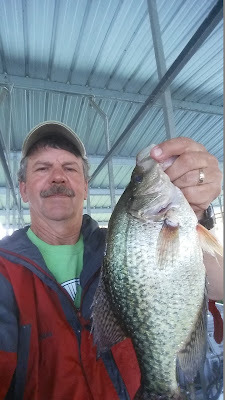 The fish are hitting a little bit of everything when they are active. I have been using a fluke, rattle trap, Kastmaster and a Zara spook and all of these baits have landed some nice fish. Most of my big spotted bass have hit live bait set at 24 feet. 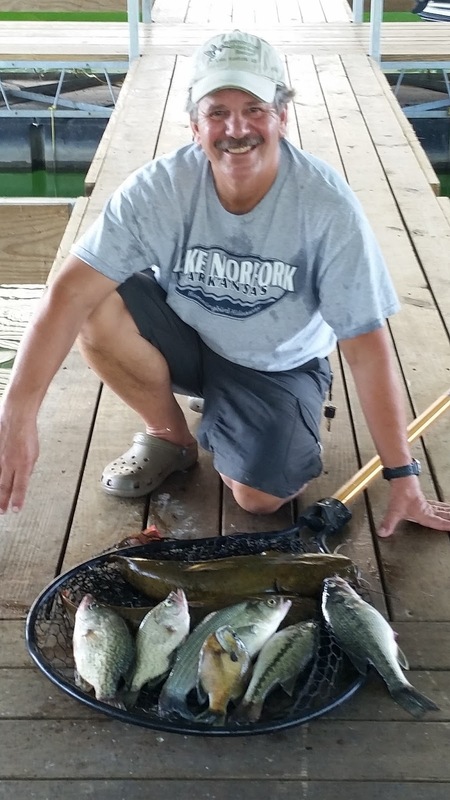 Large flats are another good area to fish. 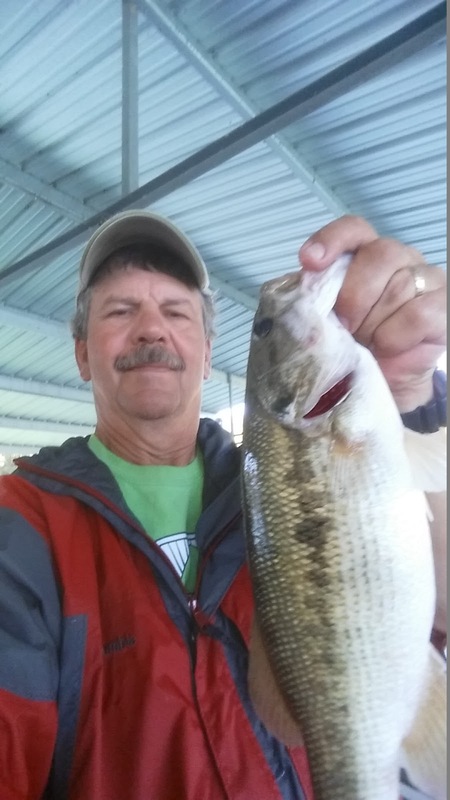 Look in the 25 - 35 feet depths and you will find scattered schools of white bass, largemouth bass, crappie, catfish and walleye. 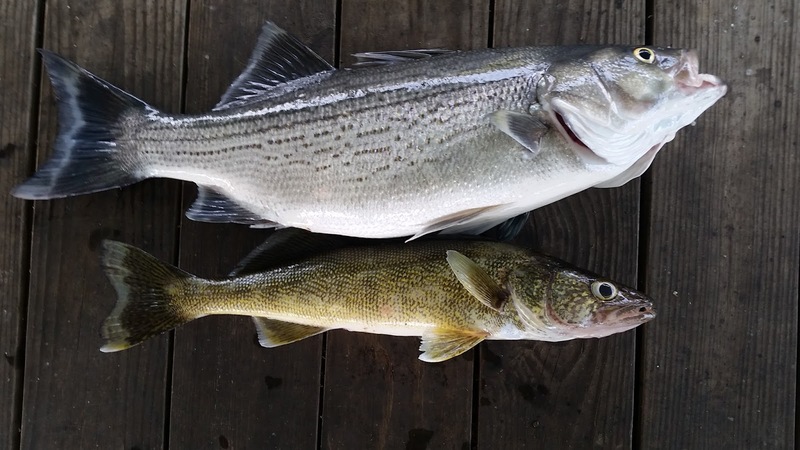 I have been vertical jigging a spoon on the flats and once I find the bait I find the fish right in the same spot. Norfork Lake water depth is falling very slowly and currently sits at 553.74. Periodic power generation is occurring daily. The lake surface water temperature is also falling slowly and was in the low 80's this morning. The main lake is clear and the creeks and coves are still stained.